English edition In the legend, Hinemoa lives by Lake Rotorua and Tutanekai on the island, Mokoia. Hinemoa falls in love when Tutanekai plays the flute, but Hinemoa's father considers him unsuitable. They vow to be together, and every night on the island,Tutanekai plays his flute ... read full description below. 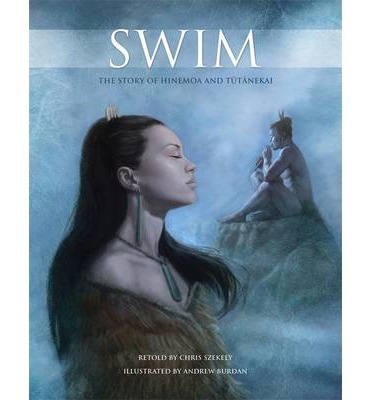 English edition In the legend, Hinemoa lives by Lake Rotorua and Tutanekai on the island, Mokoia. Hinemoa falls in love when Tutanekai plays the flute, but Hinemoa's father considers him unsuitable. They vow to be together, and every night on the island,Tutanekai plays his flute to guide Hinemoa to him. With no canoe, Hinemoa must swim the lake with mystical creatures in it to be with Tutanekai. The book is available in Maori and English language versions. THE AUTHOR Chris Szekely is Chief Librarian of the Alexander Turnbull Library - the first Maori person in this position. He was previously City Librarian at the Manukau City Council, heading one of the largest public libraries in New Zealand and was instrumental in setting up Te Ropu Whakahau, the association of Maori librarians. Chris wrote Rahui, illustrated by Malcolm Ross, which won the Picture Book Category, New Zealand Post Children's Book Awards, 2012. THE ILLUSTRATOR Andrew Burdan is a freelance illustrator who has illustrated children's books, educational materials and story boards, and he was the illustrator of the award-winning Hautipua Rererangi and Ngarimu Te Tohu Toa.